I always hear the words 'If opportunity knocks at your door be ready to open and grab it'. They say that it will not knock at you several times so don't pass the chance to open the door. But what if it doesn't knock? Does it mean that no opportunity will ever come to you? 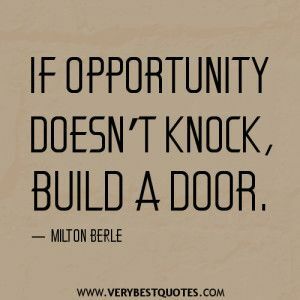 Well if that's the case you should build an opening or a way on how you can get good opportunities. Build your own door and through God's guidance you'll be able to see that opportunities doesn't only knock but forces its way through even without knocking. If the opportunity is meant for you it will be given to you through the help of prayers also.